DeskManager and WebManager are stand-alone platforms, but they also are designed to work even better together. Information sharing between DeskManager and WebManager can drastically cut down on manual data entry, saving time and money for your dealership. DeskManager can send updates to WebManager automatically whenever changes are made to a vehicle. Your changes will be immediately reflected on your website, so visitors always know the latest status of the vehicles they’re viewing. New vehicles you add to DeskManager will be added to your Staging inventory in WebManager, while vehicles you’ve already activated will be updated in your Live inventory. If you’d like, you can prevent one program from overwriting the other. Sell a vehicle in DeskManager, and it will instantly be marked "sold" in WebManager – no fielding phone calls from confused shoppers. Vehicles that are no longer available in DeskManager are archived in WebManager. Vehicle data in DeskManager can be transferred to WebManager "as is", or you can use WebManager's VIN decoder to look up data for the vehicle, including Year, Make, Model, Series, Body Style, Transmission, Factory Colors, complete vehicle Features and Options, and much more. Your vehicles can have up to 100 photos in DeskManager, which get automatically resized and uploaded to your WebManager website. Sync your latest additions, deletions, and reordering with ease. 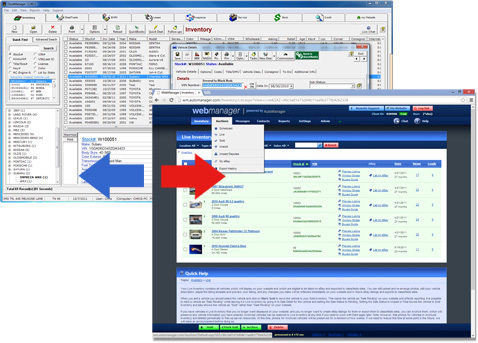 The "My Website" tab in DeskManager brings you right to your WebManager dealership website. Click "Configure WebManager" to log in to your WebManager account and manage inventory, leads, website settings, and more.